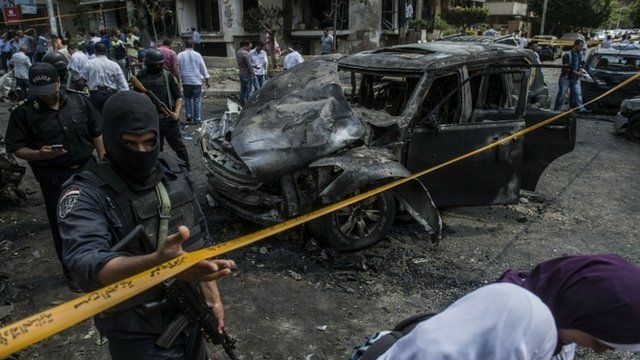 Hisham Barakat 'a major scalp' Jump to media player Egypt's public prosecutor, Hisham Barakat, has been killed in an apparent bomb attack on his car in Cairo, officials say. Security boost at Egypt's ancient sites Jump to media player The Egyptian President Abdel Fattah al-Sisi orders the strengthening of security at ancient monuments across the country. Suicide attack at Luxor temple Jump to media player Police in Egypt say they have foiled an attempted suicide bomb attack at the Temple of Karnak in Luxor, one of the country's most popular tourist sites. Outcry over Egypt's death penalties Jump to media player Egypt faces widespread criticism over the increasing numbers of Islamists being sentenced to death, reports the BBC's Sally Nabil. 'Ultimate punishment' for Egypt's Morsi Jump to media player An Egyptian court has sentenced ousted president Mohammed Morsi to death over a mass prison break in 2011. What happened to Morsi? In 70 secs Jump to media player Deposed Egyptian President Mohammed Morsi has been sentenced to 20 years in jail. Why? BBC News explains, in 70 seconds. Brotherhood leader sentenced to death Jump to media player Muslim Brotherhood leader Mohammed Badie and 13 others are sentenced to death by an Egyptian court for planning attacks against the state. Egypt's public prosecutor, Hisham Barakat, has been killed in an apparent bomb attack on his car in Cairo, officials say. Two bodyguards were also injured in the attack, which targeted the vehicle in the Cairo suburb of Heliopolis. Mr Barakat has referred thousands of Islamists to trial since the overthrow of President Mohammed Morsi in 2013. The BBC's Sebastian Usher said that his death would be considered a "major scalp" by the Islamist behind the attack.